UBER provides a wide range of repair services for the structural envelope of historic and modern buildings. These services focus on an accurate assessment of the structure’s condition, identification of deteriorated areas, investigation regarding the cause of the damage and a detailed, prioritized and costed plan for the repair. The company provides concrete restoration services for both historic and modern structures. Following assessment of the structure, including cracks, major damage, efflorescence, biological growth, etc., a remedial plan is prepared. Structural repairs which contributed to the damage are repaired. Replacement pieces are custom fabricated as needed, with texture and color matching. Cleaning and stripping techniques are utilized to restore the concrete to its proper color and texture. UBER approaches facade stabilization by first identifying the structural method utilized in connecting the facade with the supporting structure of the building, i.e. whether it is load-bearing, structural or a veneer. A detailed assessment is made of both the condition of the facade, the causes of any failure and the approach to stabilization. 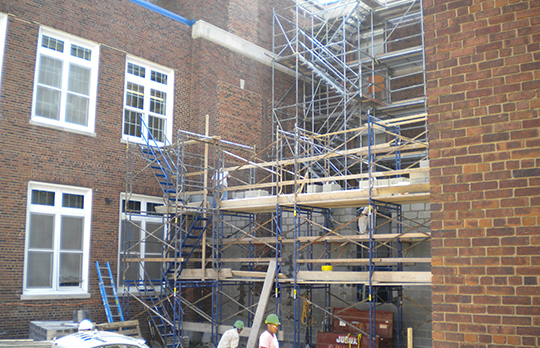 Following stabilization, our team can provide restoration of parapets, railings and other elements of the structure. We provide a complete testing service for building envelopes. This includes but is not limited to cladding systems, curtain walls, windows, doors, roofing systems and space frames. These inspections include an assessment of any damage, discoloration or functional deficiencies. Our specialists will visually inspect as well as test pointing, joints and seals and will open for internal inspection any potentially problematic areas. Detailed reports and repair proposals, where appropriate will be provided to the client.